We're now on our third pass through all 366 of these day-by-day listings. We're regularly adding to them, expanding them, enhancing them and, of course, spotting errors and typos. Bear with us and we continue to improve your user experience. One of only ten women flight instructors in the US, she flew nearly every airplane in the Army Air Forces inventory and taught flying to over 350 men in the Government's pre-WWII Civilian Pilot Training Program. An insider's look at the people of Bikini Atoll, site of 23 U.S. nuclear weapons tests from 1946-54; a view of history from the islanders' perspective. CBI - China: Day 10 of 154 of the Japanese Invasion of Manchuria. Germany: The Nazis blame communists for the Reichstag fire. Spain: Day 73 of 985 of the Spanish Civil War. Spain: Day 438 of 985 of the Spanish Civil War. CBI - China: Day 83 of 2,987 of the 2nd Sino-Japanese War. Day 46 of 106 of the 2nd Battle of Shanghai. Day 27 of 70 of the Battle of Taiyuan. Germany: Jews are prohibited from all legal practices. Spain: Day 803 of 985 of the Spanish Civil War. CBI - China: Day 448 of 2,987 of the 2nd Sino-Japanese War. Day 109 of 139 of the Battle of Wuhan. Poland: Day 27 of 36 of Germany's Invasion of Poland. Warsaw falls and Poland surrenders to Germany. Polish government-in-exile is set up in Paris. Poland: Day 11 of 20 of the USSR's Invasion of Poland. Near Grabowiec, 150 Polish policemen, 4 NCOs and 6 officers among 5,000 taken prisoner, are executed by the Soviets. CBI - China: Day 813 of 2,987 of the 2nd Sino-Japanese War. Day 15 of 26 of the 1st Battle of Changsha. Germany: Germany, Italy and Japan sign Tripartite (Axis) Pact. Japan reasons that this will deter the US from interfering in its affairs. The Tripartite Pact (aka the Three-Power Pact, Axis Pact, Three-way Pact or Tripartite Treaty) was signed in Berlin on 27 Sep 40, which established the Axis Powers of World War II. 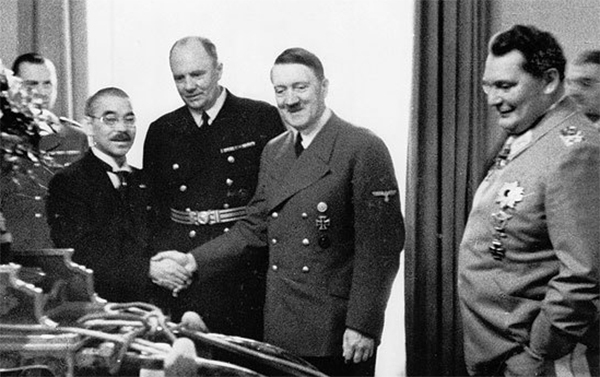 The pact was signed by representatives of Nazi Germany (Adolf Hitler), Fascist Italy (foreign minister Count Galeazzo Ciano), and Imperial Japan (Japanese ambassador to Germany Saburo Kurusu). The three nations agreed that for the next ten years they would "stand by and co-operate with one another in... their prime purpose to establish and maintain a new order of things... to promote the mutual prosperity and welfare of the peoples concerned." They recognized each other's spheres of interest and undertook "to assist one another with all political, economic and military means when one of the three contracting powers is attacked" by a country not already involved in the war, excluding the Soviet Union. The pact supplemented the Anti-Comintern Pact of 1936 and helped heal the rift that had developed between Japan and Germany following the 1939 Molotov-Ribbentrop Pact between Germany and the Soviet Union. ETO - UK: Day 22 of 258 of the Blitz. Luftwaffe loses 52 planes while the RAF lose 28. ETO - UK: Day 80 of 114 of the Battle of Britain. East Africa: Day 110 of 537 of Italy's East African campaign in the lands south of Egypt. CBI - China: Day 1,179 of 2,987 of the 2nd Sino-Japanese War. Day 318 of 381 of the Battle of South Guangxi. Day 39 of 42 of the Hundred Regiments Offensive. USA: "Liberty Fleet Day" is declared by FDR as the first 14 Liberty Ships are launched at the Baltimore naval dockyard, beginning with SS PATRICK HENRY, the first of 2,710 that will be built during the war to carry cargo and men across the Atlantic and Pacific. 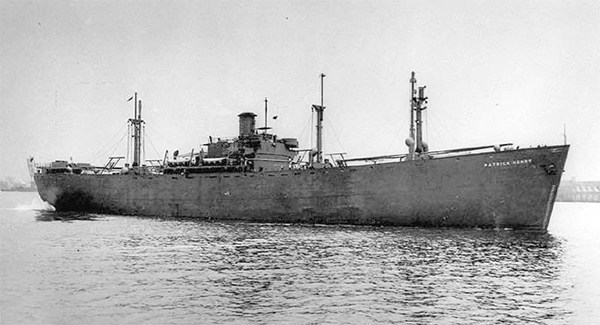 Liberty Ships initially had a poor public image and to try to assuage public opinion, September 27, 1941 was designated Liberty Fleet Day, and the first 14 "Emergency" vessels were launched that day. The first of these was SS PATRICK HENRY, launched by President Franklin D Roosevelt. In the speech delivered at the launching, Roosevelt referred to Patrick Henry's "Give me Liberty, or give me Death" speech of 23 March 1775. Roosevelt said that this new class of ships would bring liberty to Europe, which gave rise to the name "Liberty Ship." Her maiden voyage was to the Middle East. During World War II she made 12 voyages to ports including Murmansk, Trinidad, Cape Town, Naples and Dakar. She survived the war, but was seriously damaged when she went aground on a reef off the coast of Florida in July 1946. The ship was laid up at Mobile, Alabama, and was scrapped at Baltimore in 1958. A total of 2,710 Liberty Ships will be built during the war to carry cargo and men across the Atlantic and Pacific. The Patrick Henry took 244 days to complete, but the average will soon drop to 42 days. The record was set by SS ROBERT E PEARY, launched just 4 days after the keel was laid. Russian Front - Finland: Day 98 of 164 of the Battle of Hanko. The Soviets will be forced off their leased naval base. Russian Front - Finland: Day 24 of 28 of Finland's reconquest of East Karelia in southern Finland. The Soviets continue withdrawing from Finland back to Leningrad. Russian Front - Finland: Day 91 of 142 of Operation SILVER FOX, a joint German-Finnish campaign to capture the Russian port of Murmansk in the Arctic. The German troops continue withdrawing back into northern Finland. Russian Front - Finland: Day 89 of 140 of Operation ARCTIC FOX, a joint German-Finnish campaign against Soviet Northern Front defenses at Salla, Finland. Russian Front: Day 98 of 167 of Germany's Operation BARBAROSSA, the overall invasion of the USSR. The first of the autumn rains start falling and quickly turns the ground to mud. Russian Front - North: Day 20 of 872 of the Siege of Leningrad. Russian Front - South: Day 51 of 70 of the Siege of Odessa, Ukraine. 23,000 Jews are killed at Kamenets-Podolsk, Ukraine. Russian Front - South: Day 2 of 12 of the Battle of the Sea of Azov (north of Black Sea). MTO - Libya: Day 171 of 256 of the Siege of Tobruk. East Africa: Day 475 of 537 of Italy's East African campaign in the lands south of Egypt. After three plus months of fighting, British forces in Abyssinia (Ethiopia) capture the Wolchefit Pass, opening the route to Gondar, the last Italian held town in East Africa. CBI - China: Day 1,544 of 2,987 of the 2nd Sino-Japanese War. Day 22 of 33 of the 2nd Battle of Changsha. Russian Front - North: Day 385 of 872 of the Siege of Leningrad. Russian Front - North: Day 146 of 658 of the Siege of the Kholm Pocket, USSR lays siege to the Kholm Pocket but the Germans hold out for a about a year and a half. Russian Front - Center: Day 60 of 64 of the 1st Battle of Rzhev-Sychevka, Russia. Though it will end in a stalemate, it will keep German troops from going to Stalingrad. Russian Front - South: Day 92 of 150 of Germany's CASE BLUE, the failed offensive to take the Caucasus oil fields. Russian Front - South: Day 36 of 165 of the Battle of Stalingrad, the bloodiest battle in human history. German 6th Army succeeds in capturing most of the strategic Mamayev Kurgan hill and penetrates the heavily defended Red October and Barricades housing estates. MTO - Libya: US B-24s attack a vessel at Benghazi. East Africa: Day 146 of 186 of the Battle of Madagascar. CBI - Burma: British begin a new offensive in Burma. CBI - China: Day 1,909 of 2,987 of the 2nd Sino-Japanese War. PTO - Alaska: Day 113 of 435 of the Battle of Kiska, Aleutian Islands. The US and Canada will defeat the Japanese invaders. PTO - Malaya: Day 221 of 357 of the Battle of Timor Island, a long guerrilla war ending in Japanese victory. PTO - New Guinea: Day 69 of 119 of the Battle of the Kokoda Track. The Australians continue pushing back the Japanese troops. This will become an Allied victory. PTO - Solomon Islands: Day 52 of 187 of the Battle of Guadalcanal. ETO: US 8th Air Force: The first Pathfinder (PFF) led mission, taking B-17s to Emden, Germany. Meanwhile B-26s attack airfields in France. Russian Front - North: Day 750 of 872 of the Siege of Leningrad. Russian Front - North: Day 511 of 658 of the Siege of the Kholm Pocket, USSR lays siege to the Kholm Pocket but the Germans hold out for a about a year and a half. Russian Front - North: Day 2 of 15 of the USSR Kremenchug Offensive into Estonia. Russian Front - Center: Day 52 of 57 of the 2nd Battle of Smolensk, Russia. A Soviet victory as the Axis will be completely cleared from the Moscow region. Russian Front - Center: Day 42 of 48 of the Battle of Bryansk, Russia. German troops continue evacuating the Bryansk area. Russian Front - South: Day 35 of 122 of the Battle of the Lower Dnieper River, USSR. Germans begin a general withdrawal of all forces in the Ukraine to positions on the west bank of the Dnieper river. Russian Front - South: Further south, the Russians take the last German held port on the Black Sea at Temyruk. MTO - Italy: The RAF, US 9th and 12th Air Forces provide the air cover for the Allied ground troops. CBI - China: Day 2,274 of 2,987 of the 2nd Sino-Japanese War. PTO - New Guinea: Day 9 of 219 of the Battle of Shaggy Ridge. This will become an Allied victory. PTO - New Guinea: Day 6 of 162 of the Battle of the Huon Peninsula. This will result as an Allied victory. PTO - New Guinea: US 5th Air Force conducts heavy air raid against Wewak. PTO - Solomon Islands: Day 44 of 56 of the Battle of Vella Lavella. The Allies will win this one. ETO - Germany: The Kassel Mission: The 445th Bomb Group suffers the largest loss by a USAAF bomb group on any mission in WWII, losing 31 of the 35 B-24 Liberators that drop their bombs. Of the 336 men who make up their crews, 117 are KIA and 121 are taken POW. Only 98 men will eventually be returned to duty. This spotlight is under construction. Be patient. The German city of Kassel was the target of regular bombing raids from Feb 42 to Mar 45. This mission aimed to destroy the Henschel motor works where Panzer and Tiger II tanks were being produced. Three Bombardment Divisions of B-17s and B-24s, totaling over a thousand heavy bombers, were dispatched this day, along with escorts of P-38, P-47 and P-51 fighters. The force was made up of 315 B-24 Liberators from the 2nd Air Division, 39 of which were from the 445th Bomb Group. But the real story is what happened to the 445th Bomb Group this day after "accidentally" veering off course and bombing Göettingen instead. Due to gross navigational and mechanical problems onboard the lead aircraft to the bombsight and a gross leadership failure on the part of the Command Pilot, the 445th Bomb Group formation left the protection of the main bomber stream's fighter cover and bombed what they thought was Kassel, but was really the town of Göettingen, 25 miles northeast of Kassel. An undercast made ground references unavailable. After coming off the target and following the planned route, the formation was attacked by a fighter force of approximately 150 aircraft (100 Fw-190s and 50 Bf-109s). Twenty-five B-24s went down in less than 5 minutes. Only the timely arrival of friendly fighter cover allowed the remaining ten planes able to escape. Three B-24s made forced landings behind friendly lines on the Continent (2 in France, 1 in Belgium); two B-24s made landings at an emergency strip on the English coast at Manston, one B-24 crashed near Old Buckingham (453rd BG) and four B-24s returned to their base at Tibenham, Norfolk, England. This was the greatest loss suffered by a single unit on a given mission in all of WWII — 31 of 35 planes, an 88.6% loss rate! So the 445th Bomb Group "accidentally" veered off course and bombed Göettingen instead of Kassel, eh? On large bombing missions it was not uncommon for wings (and divisions) to split off from one another to attack separate targets. Although it was less common for a single bomb group to leave their formation to attack their own target, it did happen now and then. It is suspected that the 445th BG may have done just that when they "veered" off course to Göettingen. It has been suggested that there was an unofficial agreement between Churchill and Hitler not to target each other's universities, a claim negated by a long list of bombing raids on such by both sides. The allegation is that the 445th was ordered to strike either the university at Göettingen or a target nearby and to make it look like an unintentional accident. Whether you choose to digest any of this information or to dismiss any or all of it is entirely up to you. During the 1930s, Göettingen housed the top math-physics faculty in the world, led by eight men, almost all Jews, who became known as the Göettingen eight. Their members included Leó Szilárd and Edward Teller. This faculty was not tolerable to the Reich, however, and the University of Göettingen suffered greatly as a result. The Göettingen eight were expelled, and these men were forced to emigrate to the West in 1938. Szilárd and Teller went on to become key members of the Manhattan Project team. Ironically, Nazi racial policies prevented the application of breakthrough insights to physics, which stifled further development of physics in Germany. After the end of WWII, the famous university had to be reorganized almost from scratch, especially in the departments of physics, mathematics and chemistry, a process which has continued into the 21st century. The synagogue in Göettingen was destroyed during Kristallnacht on 09 Nov 38. Many of the Jews of Göettingen were killed in Nazi German extermination camps. Also, there was a concentration camp for adolescents in Moringen, which was not liberated until 1945. ETO - France: Day 58 of 284 of the Battle of Brittany. ETO - Belgium: Day 26 of 62 of the liberation of Belgium. ETO - France: Day 13 of 236 of the Siege of Dunkirk. ETO - Germany: Day 9 of 145 of the Battle of Hürtgen Forest. ETO - Germany: US 8th Air Force sends three Bombardment Divisions on maximum effort missions to central Germany, one of which is Kassel (see Spotlight above)). Russian Front - Finland: Day 13 of 223 of the Lapland War. Finland and Russia have joined forces to kick the Germans out of Finland's most northern province. Russian Front - North: Day 14 of 41 of the Battle of Riga, Latvia. Russian Front - Center: Day 14 of 72 of the Battle into East Prussia and northern Poland. 2,000 soldiers of the Polish Home Army surrender in Mokotow district of Warsaw. Russian Front - South: Day 14 of 72 of the Battle of Belgrade, Yugoslavia. MTO - Italy: US 12th Air Force: A-20s bomb a motor transport in the Po Valley, fighters continue support for US 5th Army hitting at Monte Oggiolia and between Parma and Piacenza. MTO - Greece: German forces of Army Group E evacuate from western Greece. CBI - Burma: Day 180 of 302 of the Chinese Salween Offensive in Burma. CBI - China: Day 2,640 of 2,987 of the 2nd Sino-Japanese War. Day 164 of 259 of Japan's Operation ICHI-GO. PTO - New Guinea: Day 288 of 597 of the Battle of New Britain. PTO - New Guinea: Day 159 of 481 of the Battle of Western New Guinea. PTO - Palau Islands: Day 13 of 74 of the Battle of Peleliu (Operation STALEMATE II). PTO - Palau Islands: Day 11 of 36 of the Battle of Angaur. 1941: The first 14 of 2,710 Liberty Ships are launched on "Liberty Fleet Day"
A very readable book about the armed guard on Liberty Ships. It gives good insight on what it was like serving on a Liberty Ship during WWII. Veterans of the 445th Bomb Group tell a side of life in WWII that is often left on the cutting room floor of documentaries. 71 American destroyers went down during WWII, and this meticulously researched book describes the history of each - from launch to the ship's final hours.